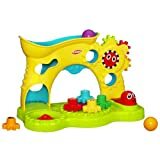 At first glance the Playskool Musical Activity Ball and Gear Center looks impressive. It has five gears, music, and balls that drop, but then you realize.. is that it? The gears turn and music plays, but the balls simply roll seemingly without a purpose. You can see it in the video, but the concept is pretty basic you push a button, the gears spins, and music plays. While to me it seems pretty simple, but my 11-month old-daughter enjoys playing with it. While I wouldn’t call it her favorite toy she does enjoy it….almost to my amazement. Final Verdict – My initial thought was that my daughter would lose interest in less than 2 minutes, however I am surprised that she is playing with it a week later. Overall, this toy is pretty fun for a baby. I’ve played with my friend’s 14 month-old with this toy and it kept her occupied for a good 15 minutes. She had a lot of fun figuring out where to put the balls and got excited anticipating them to pop out; also she had fun taking the gears off and putting them back on and turning them. The balls are large enough that she can’t fit them in her mouth and there’s a little slot for the balls to stay in when you’re not using them (so they don’t get lost). It’s pretty sturdy as she was being a bit rough with it and didn’t fall apart. The music is not totally annoying, so that’s a plus too. Durable and easy to assemble are the highlights of this Playskool toy. Otherwise, it’s had it’s 5 minutes of fame in our home, and likely will be stashed away while my young sons play with other toys they find more amusing. My boys are 8 months and 2 years old. The 2 year old likes to run around with the balls best, and finds the rest of toy less than engaging. My 8 month old has been amused with the music playing, and may become interested in turning the gears–that is if the toy even still interests him in the near future. The gears turn well and they stack easily, but they don’t DO anything. Turning the gears doesn’t make the music turn on, or make the balls drop. The balls must be manually dropped down, and all they do is drop. When they drop, they don’t cause the music to turn on, either. Only pushing down the red smiley face on the right corner makes the music go. If pushed far enough down, the gears will also turn. If the gears played more of a role in causing the music to play or the balls to roll, I probably would have rated this toy better. As it is, the elements are not related to each other at all. Overall, save your money for other toys which will likely get better use.